Sometimes, half an inch is all that stands between life and death. Abraham Snow’s career ended with a single shot. Left for dead, the undercover operative barely survived an assassin’s bullet. After a long and painful recovery, Snow retires. He returns home to rest and recuperate only to get swept up in the family business, one just as dangerous as his previous profession. When he thwarts an assassination attempt on a diplomat who endangers his sister, Snow leaps into action to keep his family out of a highly trained killer’s crosshairs. 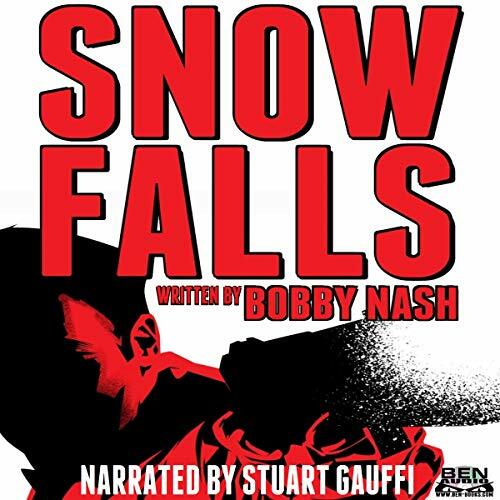 Snow Falls is the first audiobook in the continuing adventures of Abraham Snow. A fast-paced action novella that introduces us to Abraham Snow, a spy who tries to retire after recovering from an almost-fatal bullet shot – but circumstances (and his family) conspire to keep him from doing so. Snow’s grandfather Archer Snow is an amazing character! DragonCon fans will recognize the Atlanta hotel where most of the action takes place. Stuart Gauffi, the Audible narrator, has a great voice for this story. Highly recommended! Snow Falls is about a military man finding his new place in life when he is thrust back into active duty. It sets up an interesting family dynamic and a cast of adversaries for the next books of the series while providing a fun, easy read. The main character, Abraham Snow, is a Jack Ryan type in that he makes a good perspective for readers to follow into whatever plot is set before him.